Training and knowledge are of essential importance in achieving the quality of our work. Correct tree pruning techniques depend on a workforce with good skills, the right attitude and with the appropriate level of training. Our staff have been made aware of the importance of correct pruning and their work is kept to a high standard. 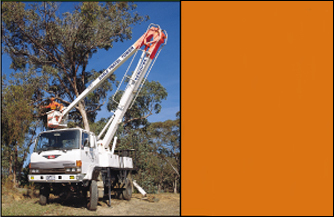 Eagle Travel Tower Services operate under a fully documented Occupational Health & Safety System based on the Victorian WorkCover Safety Map and guidelines and Australian Standard AS/NZS4801. The Safety System documentation has been Second Party (independently) assessed against Safety Map and AS/NZS4801 by Quality Society of Australasia registered Auditors and is subject to six monthly internal audit requirements. Tree Hazard and Health Reports. Protection of trees on construction sites. Hazard Assessment and Risk Management. Auditing of Vegetation in an Electrical Environment. Auditing of local Government and Private Utilities Assets. 24 Hour Emergency Service - eg. Storm Damage. Hazard Reduction Cabling and Bracing Installation. Root Intrusion and Protection Barrier Installation. and other Utilities and Assets. Spaces, Street scapes and Reserves.